Young designers from Pennsylvania recently won this year’s FIRST Tech Challenge with their autonomous robots. The Giant Diencephalic BrainSTEM team of Pennsylvania robotics students. Tomorrow’s engineers, scientists, and robot designers are starting to learn their craft at a much earlier age. Many of them are even designing robots and competing in international events against some of the brightest young minds in the world. A team of Pennsylvania robotics students has not only won some awards this spring, but also made world records in the process. Students can get a taste for robot design and construction through FIRST — For Inspiration and Recognition of Science and Technology — a nonprofit advancing education science, technology, engineering and math (STEM). FIRST provides a progression of four international after-school programs. Students in grades K-8 work with Legos. Older students compete in FIRST Tech Challenge, in which they are required to design, build, program, and operate robots to play a floor game in an alliance format. Teams raise funds, design and market their team brand, and do community outreach. The season runs throughout the school year and concludes with the international FIRST championship. FIRST also conducts a robotics competition, where students design and build robots to compete in high-intensity events. Dean Kamen founded the FIRST competition in 1989. Kamen is best known as the inventor of the Segway. The American engineer, inventor, and businessman started FIRST to give students a competitive environment similar to sports competitions. The winning FIRST Tech Challenge robotics team set four world records with its creation. In the inaugural robotics competition in 1992, 28 teams competed in a high school gymnasium in New Hampshire. This year, 3,650 teams from 27 nations participated in the robotics competition, including more than 3,000 teams from the U.S. This year’s FIRST Tech Challenge featured 5,358 teams from 10 countries. The competitions include district, state, and regional events. Challenge participants have access to millions of dollars of scholarships, and robotics students can volunteer to help with administration, fundraising, community outreach and technical advising. 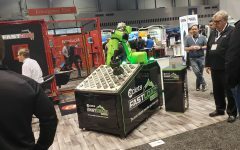 A team of Pennsylvania robotics students set four world records in this year’s FIRST Tech Challenge, called “Relic Recovery.” The challenge required robots to collect and score “glyphs,” or foam cubes, in various patterns. They also had to retrieve “jewels,” transfer “relics,” park on balancing “stones,” and navigate to specific parts of the field — all autonomously. The robots include spinning collectors, elevating depositing-platforms, and robotic arms all built onto fast moving omni-directional drive trains. In its most recent competitions, the Pennsylvania team won the Ohio State Championship and competed in the First Tech Challenge Super-Regional North Championship, where it earned a berth to compete in the world championships. The world championship will be held in Detroit from April 24-28. The team set two world records on the same day at an event in Ohio back in December and subsequently held that record until its big score at the Pennsylvania tournament in late January. It set another world record at the Ohio State championship in March. “It took about two months to get a basic working design,” said James Walton, captain of “The Giant Diencephalic BrainSTEM” team. Even with their school commitments, the Pennsylvania robotics students worked as much as 40 hours a week to design their robot. The team’s unit includes lightweight, plastic linear slides manufactured by igus, a German company with a presence in East Providence, R.I. The slides helped the team design fast, smooth scoring mechanisms. Walton and his teams have also been using igus’ T-Profile and N-Series slides that require no lubrication, are resistant to dirt, and offer low vibration and noise and an extended service life. Kamen’s vision when he created FIRST nearly 30 years ago has helped students find their science and engineering path. This year’s sponsors for FIRST championship events include Qualcomm, Google, Magna International, Delta Air Lines, FedEx, Ford, General Motors, and dozens of other high-tech companies. There are two championship sites, in Detroit and Houston, and the events are estimated to have a collective economic benefit of $30 million for the host cities. Thomas Renner, who is based in Connecticut, is an award-winning journalist who writes frequently on manufacturing, trades, and robotics.